During my birthday visit to Victoria, I spent some quality time window shopping downtown. It was a sunny, warm, beautiful weekend – you can’t ask for better shopping weather. I love to wander up and down the streets, popping into shops that catch my eye, making mental notes of things I like that I may want to go back and actually purchase. Inevitably though, all that shopping leaves you needing a little pick me up – a refreshing drink or perhaps a mid-afternoon snack. I considered a trip to Starbucks for an iced green tea latte, but quickly changed my mind when I found myself standing outside Café Bliss. Someone forgot to take a picture outside, so the business card will have to suffice. 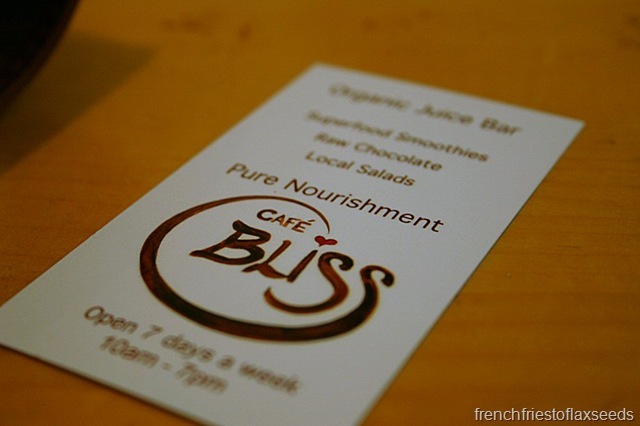 Café Bliss is an organic live food juice bar – 100% raw, vegan, organic, gluten free, local, and according to their website, 100% made with love. So west coast hippie – I love it! 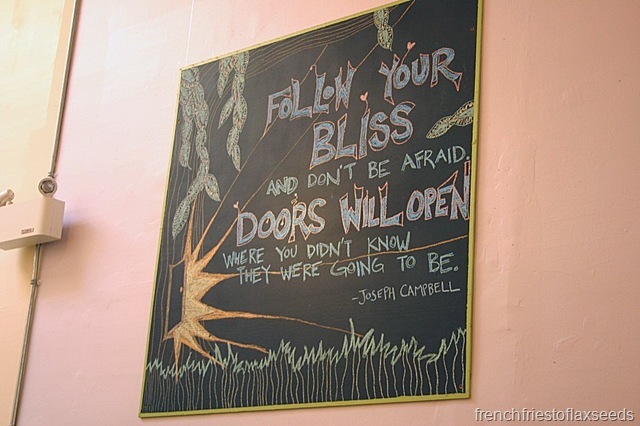 Now Cafe Bliss has been open for some time – I know they were around when I was still living in Victoria. Yet I never managed to get around to trying them out. 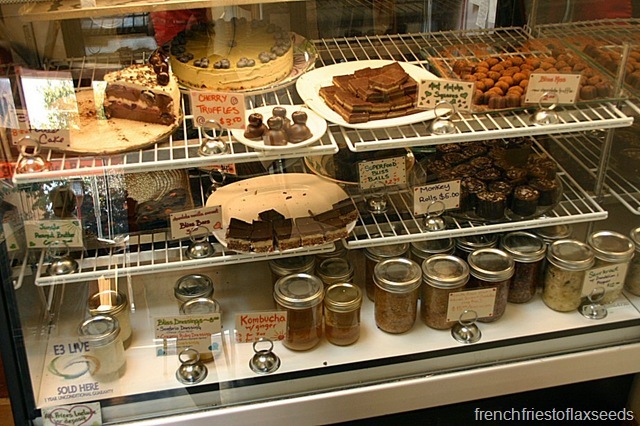 A shame I tell you – I mean, just look at the delectable treats in the display case! 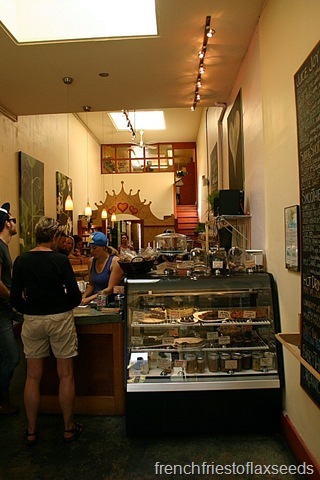 Black forest cake, mint matcha squares, monkey rolls, bliss balls, and so much more! Breakfast brownies? 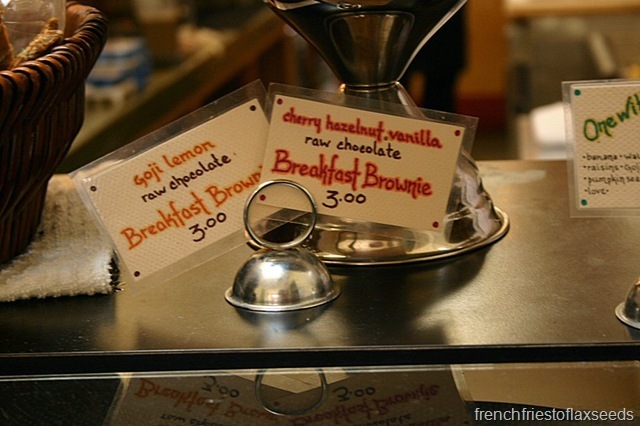 Yeah, I’m pretty sure I’d be okay with eating a brownie for breakfast. As much as I would have liked to order one of everything from the display case, I really just wanted something refreshing to drink. 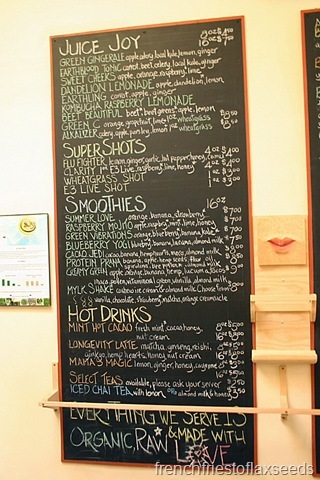 So I took my time browsing the menu of juices and smoothies. I’m pretty sure there is something on that menu for everyone’s tastes, and then some. You can understand why it took me a good 5 minutes to go through the whole thing. And then I asked the server at the counter what she recommended, because I just couldn’t decide on my own. That’s my new favourite thing to do when I go into new restaurants or when I just can’t decide – ask the server to recommend something. I’d say 9 times out of 10 it turns out awesome, and often they will direct me to something on the menu that I would normally pass over on my own. Try it next time you are unsure! 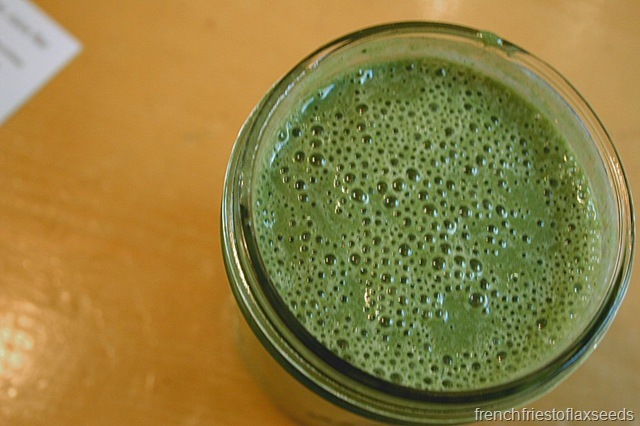 Anyways…she recommended a few smoothies that were her favourite, but when she drew my attention to the Creamy Green, I knew I had to have it. I think simply because it was going to be the same colour as the iced green tea latte I had considered getting earlier. 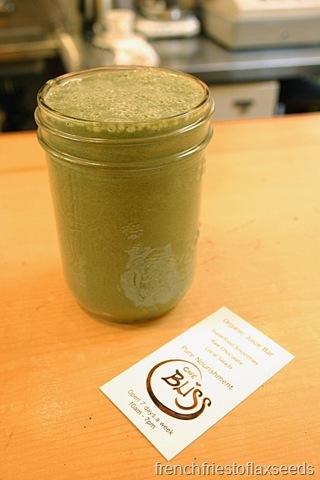 Blending up my Creamy Green smoothie – Cafe Bliss’ blender of choice appears to be the Blendtec. 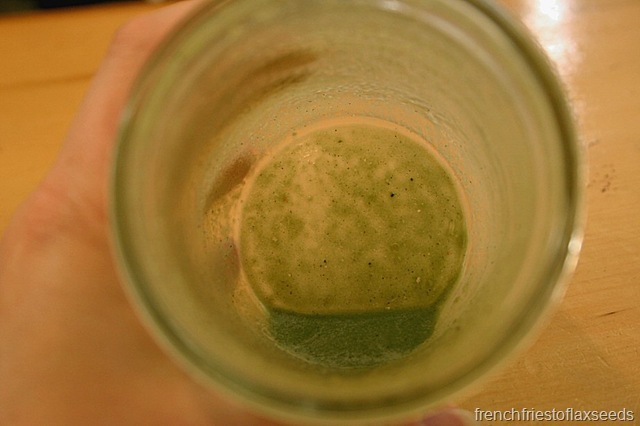 Creamy Green Smoothie – apple, orange, banana, hemp, lucuma, tocos, maca, pollen, vitamineral green, vanilla, almond milk. Say that 5 times fast! First off, I loved the choice of glassware – mason jars! 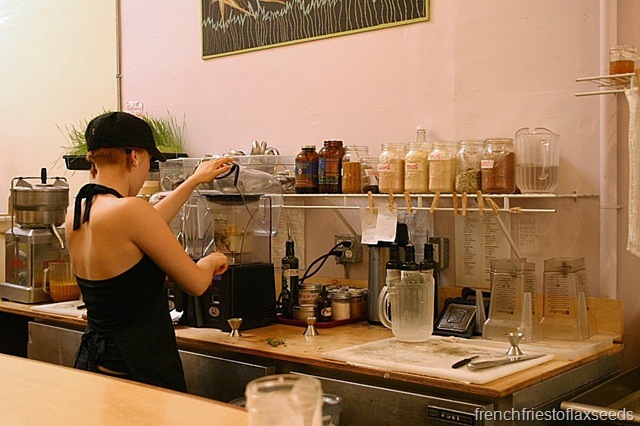 Even if you order your smoothie to go, you get a mason jar (with a lid). You just pay a deposit of $1.25 (if I remember correctly), and you get that back when you bring the jar back at a later time. Thumbs up for sustainability. The smoothie was creamy, delicious, and refreshing. I can’t say that any one flavour stood out – instead, they all played nicely to create one enjoyable drink. A little “earthy” as my mom would say, but I enjoy that. Had I been hungry, I would have loved to try out some of their creations from the food menu. 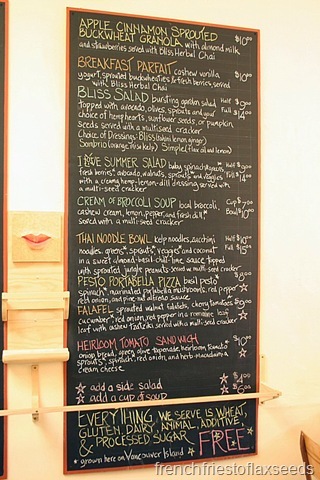 The Thai Noodle Bowl and Falafel in particular caught my eye. Too bad I didn’t have time to go back while I was still in Victoria. Guess that means I’ll need to take another trip back to my second home – preferably sooner rather than later. I could use a little bliss in my life. As soon as I saw the food menu I waas like “I would love the thai noodle bowl!” Great minds think alike!